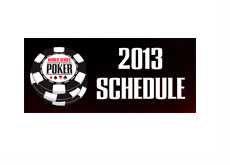 You can start finalizing your plans for this summer, as the 2013 World Series of Poker schedule has finally been released. The 44th edition of the World Series of Poker will kick off on Wednesday, May 29th. Two events will start on the 29th - the Casino Employees No Limit Hold'em event, and the $5,000 8-handed No Limit Hold'em event. The 2013 World Series of Poker will run until July 15th, where, as in previous years, the main event will be paused and then continued in the fall. The "November Nine" final table will take place on November 4th and November 5th. In total, 62 WSOP bracelets will be up for grabs in 2013, which is one more than last year.